How big would the game screen be? If it's allowed to be full-screen on modern monitors at 1x zoom, the scale should be fine. You could also make the tiles a little smaller to fit more units/space on the screen, if the other units' sizes allow for that. Actually, if you have monitor big enough (really big one! ) it will be possible to see all the map of the level (we have not defined size of our levels yet). We already made tiles smaller, yeah. Thanks for feedback! This looks like an awesome idea (and execution). I think this choice of realistic proportions really hit the spot, making soldiers uncomfortably inhuman. I would pick larger font size for stats that change during game. I mean, it's not an issue that individual unit's mobility and max health stay small, as you will mostly watch them to compare your units. But the current moves, wound status, and probably ammo should be drawn with a well-defined font. Thanks for feedback! That's just 1st version of UI so there is a high possibility that it will be changed in future. For now we already have feature of scaling it ingame. Yeah, we may face the problem of scale in future because pixel art doesn't zoom quite well. Mini-map and proper level design will help here. Hi guys! We already make game about cats in WW2 setting for some time (but it is still early WIP) and at last decided to share our progress with you. 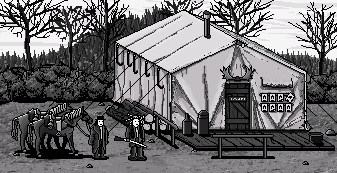 Very briefly about the game: Single player, WW2 setting, turn-based tactical combat, plot about the horrors of war. Pixel art, top quality animations, height system with multiple floors. If you grew up on such games as Fallout (1, 2), Baldur's Gate and other isometric masterpieces from 90's, then you'll enjoy our game (I hope). Feel free to ask questions! Thanks! Post updated. I'm available for some work now. Feel free to contact me. Any suggestions for what to use? The last image look interesting, where is it from? That's an entrance assignment for the game Undungeon.